Thanksss!!!!! !I'll check out the siteee!thankss dear!!!!!!! I'm following your new blog, which is gorgeous by the way, hope you can follow mine too. really nice!! !i think in topshop you can find something similar!kisses!! pues te sigo por aqui ahora!! La cadena es super bonita. Acabo de descubrir tu blog, te sigo. Si quieres pásate por el nuestro. Bsinos. Me gustan mucho, es muy fina! Te sigo desde ya!! Te vienes a mi blog! Me encantaría que me siguieras!!! thanks so much for your lovely comment, doll! your blog is absolutely stunning!! love the look with the little necklace too! I love it, they look simple and beautiful, but 600€ for a necklace like that, God that's a bit much. I love it! I love the skull necklace very much! Que chulos los colgantes, me encantó la calavera. Me encantan... Yo también estoy obsesionada con ellos! Gracias por tu comentario, a mi también me ha encantado tu blog! Además eres de Bilbao y adoro esa tierra porque tengo familia en la ciudad, un beso! The tiny skull is lovely, I agree with you ! Thank you for your nice comment and for saying you'll follow, I am following on google friend connect and waiting for you to follow now ! Te sigo wapa, tu blog engancha!!!! Me sigues???? conhecer meu canal no You tube =) se gostar se inscreva lá por miim ? Hi Zoe, thank you for visiting my blog. I'm following and look forward to your next post. 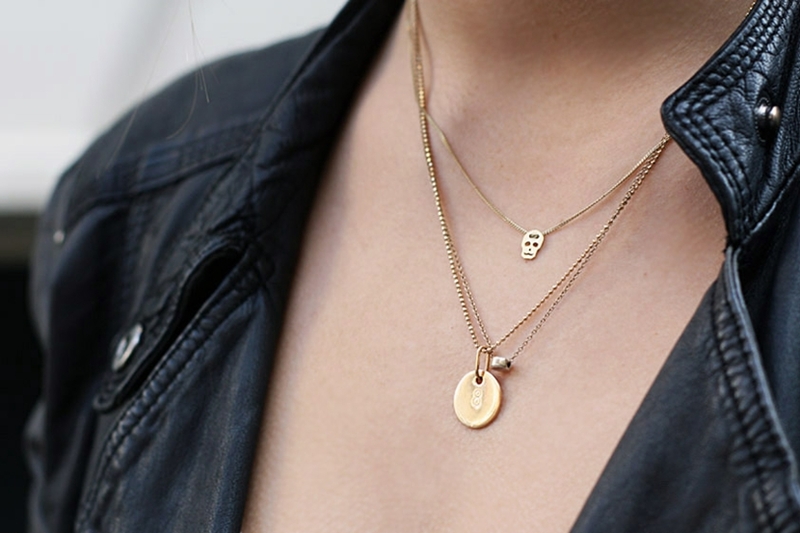 The skull miniature necklace can be easily found at Forever 21 but if you want it in 18K yellow gold I'd suggest shopping around. this new blog is awesome! Amazing post dear, so inspiring! such a cute necklace! now following your great blog! love that kind of necklaces! love the necklaces. i wear them to, but not with such a cute skull. where can i find this skull necklace? The big one it's so lovely.. The skull necklace is cute! Following you trough google friend, would be nice if you could do the same. guapisima, ya te sigo aqui tambien, es este el nuevo no?me gusta mucho el colgante de la calavera!! !un besazo preciosa! Now i'm following back on Bloglovin and GFC. Follow also on Twitter?